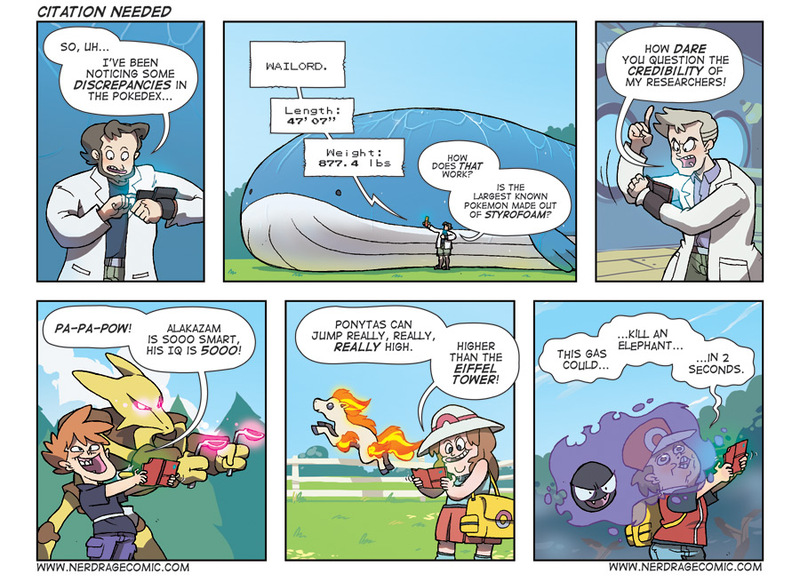 Seriously, go read the Pokedex. I guess it's to be expected when the region's top Pokemon researcher sends 10-year-olds to collect data. Heights and weights are all over the place, Pokemon are described with insane statistics.. Snorlax weighs 1014.1 lbs (despite only being 6'11), whereas Wailord weighs 877.4 lbs (47'07"). Snorlax eats "nearly 900 pounds of food each day". It eats a Wailord daily! Magmar's body temperature is nearly 2,200 degrees. Pinsir won't release an enemy until it's torn in half. Poliwrath can cross the pacific ocean just by kicking. I find the earlier entries are the often some of the weirdest. If you want to check them out, look for the entries for FireRed. FireRed's Kanto Pokemon are taken from Green (and Japanese Red), while LeafGreen's come from Blue (and US Red). In other words, FireRed's entries are the oldest but didn't officially get translated until the remakes came out in 2004.